394 pages | 43 Color Illus. | 14 B/W Illus. Located at the interface between blood and the brain, the blood-brain barrier is a dynamic permeability barrier formed by a continuous layer of specialized endothelial cells endowed with important permeability, transport, and regulatory functions that both protect the internal milieu of the brain and allow essential nutrients to be transported into the brain. Abnormalities of the blood-brain barrier are increasingly recognized as a key component in the pathogenesis of a range of primary diseases of the brain and the secondary involvement of the brain from pathological processes in other organs. 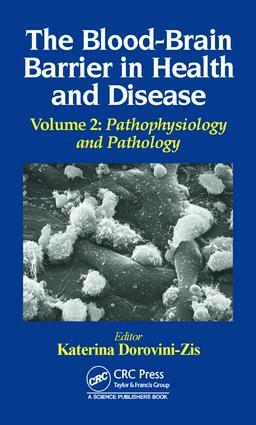 In The Blood-Brain Barrier in Health and Disease, Volume 2, international experts present comprehensive reviews and research accounts on blood-brain barrier dysfunction in infectious and inflammatory diseases, cerebrovascular diseases, stroke, trauma, vitamin deficiency, exposure to neurotoxicants, primary and metastatic brain tumors, and neurodegenerative diseases. This book is intended to serve as a guide and reference to basic and advanced information for researchers, students, and clinicians interested in this fast-expanding field and stimulate further research well into the future.